So what’s the powertrain in the new Audi Q5 Hybrid Quattro? Under the bonnet is Audi’s turbocharged and direct-injected 2.0-litre TFSI unit, good for 208bhp and 258lb ft, the latter available from 1500 to 4200rpm. There’s no manual ‘box or dual-clutch transmission, but an eight-speed automatic, with a disk-shaped electric motor in place of the torque converter. The motor itself produces 33kW and 155lb ft, and also acts as a starter motor and a generator. The total output for the system is 241bhp and 354lb ft. The result is 40.4mpg and sub-160g/km CO2, plus 0-62mph in 7.1 seconds, 138mph flat out. Not gobsmacked? Then remember that this is a car primarily designed for the diesel-despising USA. For comparisons sake, a non-hybrid 2.0 TFSI with an S-tronic transmission (what American will opt for a stick-shift SUV?) manages 7.2sec, 137mph, 32.8mpg and 199g/km. And the important figures match or best an auto-equipped 2.0 TDI’s 40.4mpg and 184g/km. The 1.3 kWh lithium-ion batteries are mounted in the boot, and Audi claims they have enough juice to allow the Q5 Hybrid to run for 1.86 miles on electric power alone at 60km/h (37mph), while the car can also drive up to 62mph in its zero emissions mode. All up the hybrid components add just under 130kg to kerbweight. Audi claims the hybrid powertrain can be used in a number of other cars, including the A8, plus the next-gen A6 and A6 Avant. Meantime, it will put the A1 E-tron into limited production for trials in Munich, and in 2012 the all-electric R8 E-tron will be launched. 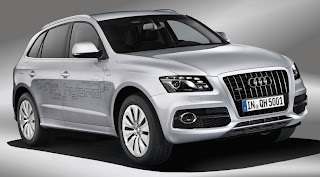 UK sales of the Audi Q5 Hybrid Quattro will start in 2011.